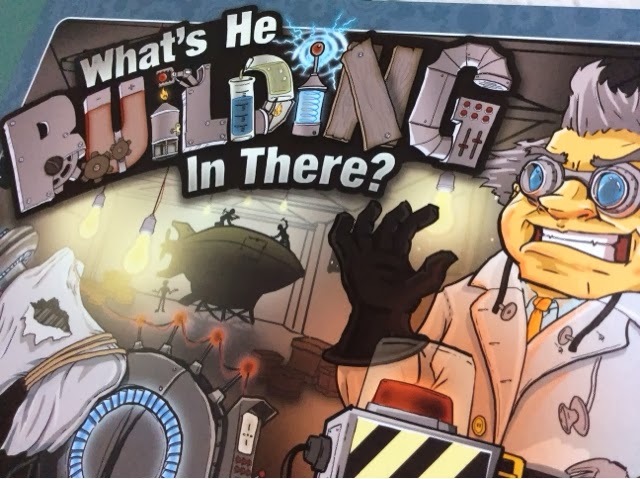 In WHBIT, players are mad scientists who are trying to build 2 contraptions - a weapon of mass destruction and an escape mobile so to speak. Failing to develope either will result in instant loss of the game. For those who have built both contraptions, it then comes down to who scored the most points in the process. 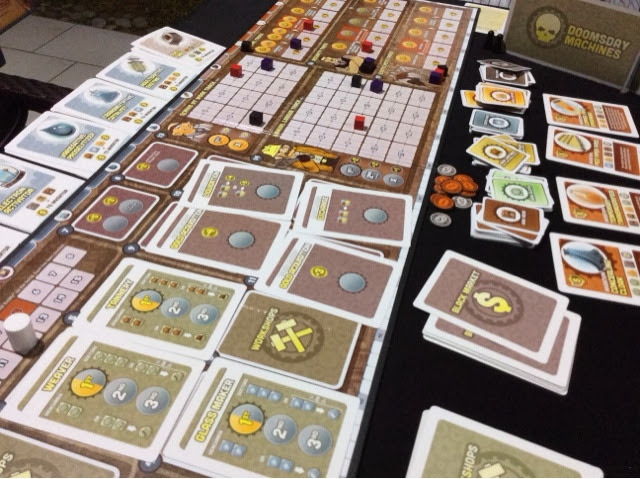 WHBIT is a typical worker placement game where players take turns to place their worker onto the board to take various actions. In WHBIT each player has 2 types of workers - a scientist and his/her minions. Certain spots can only be activated by the scientist and some only by the minions. So they have their specific uses and it's important to know how to balance their placements. Each turn, the actions available to the players change as cards are dealt out to varying spaces and will be cycled through multiple times during the game. So some of the areas that you may particularly eye for may take a turn or two to appear on the board. The action spaces are very simple in functionality. One section gives you money and the starting player token, another offers you areas to obtain basic resources and convert basic resources to refined resources. There's also an area for black market activities that allow taking of more money, converting and trading of resources. The final two areas comprise obtaining manpower hours ( which are required for building both contraptions ) and paying money to advance on various lifestyle tracks that reward players with end game points in ascending fashion. 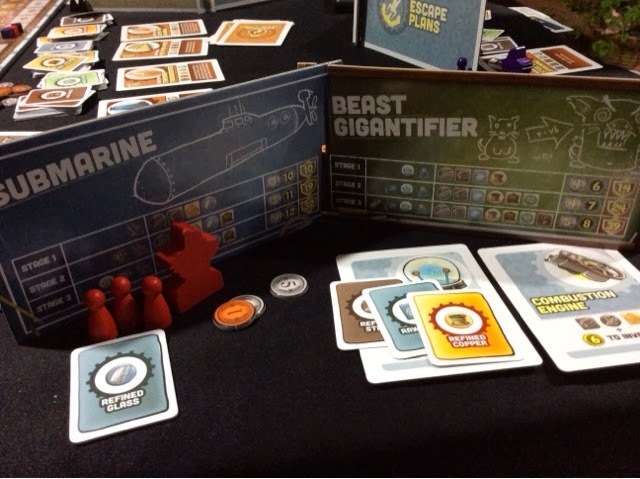 The game is played over 15 rounds after which players will build their contraptions and score points to determine the winner. There is the most interesting part of the game where every turn, if the player can afford it, he/she may invent a particular device or component that is required in the construction of most if the contraptions. The first player to invent it gets additional points, but pays more resources. The players who invent it subsequently will pay much lesser resources but they don't get points for the invention and they must pay the original inventor a sum of money ( think copyright fees ). So players are racing to invent something first as the points are well worth the while and money is tight in the game so having to pay money to another can be quite the pain. Lastly, there are special inventions that may be built also for points but mainly for the special ability it imparts to the player who invents it. These inventions come as a single type of which once built, may not be built again by anyone else. These are not required for building the contraptions but may offer very tantalizing abilities to the inventor that it may be worth the time to deviate from your plans slightly to get this invention in your grubby hands. The last way to score points is through your assigned contraptions themselves. Each contraption has 3 levels of difficulty. The first level is mandatory to be able to take part in the end of game scoring. The next 2 levels get progressively much much more difficult, but likewise reward you with much much more points. So you have to make your decision early on as to how much you want to commit to certain areas of the game. When we first started our play, we each felt that our contraptions would be far too difficult to build. Mid way through it seemed like we were further from where we thought we should be. But by game end, we all did our level 1 and both my friends managed to get one of their contraptions to at least a level 2. All I had was basic level 1 for both. I did invest heavily on the end game scoring though, but finished 2nd as the winner had built up a lot of inventions to edge me out by 2 points. WHBIT definitely nailed it when it came to the theme. It was very appealing to all of us and we couldn't help but role play during some portions of the game. The theme is unique and very approachable. Gameplay wise, I would say that it has some very interesting aspects within. I like how you raced for inventions and how the contraptions each had their own different levels of difficulty for you to aim for. You are constantly torn between deciding to invest your resources in inventing or to keep them for your final product of love. The inventions that gave you abilities was also a nice touch as it helps make the game flow differently from a standard worker placement game. I could ( and did ) have a unique ability which helped me to do things differently form others. Mine allowed me to save money when I invested on the end game scoring options. So I was spamming it to the best of my ability. WHBIT does have some things that ticked me off when it came to gameplay. I felt that the use of cards for resources was a big mistake as it made everything harder to manage from behind your screen. Cubes would have been a GREAT alternative as the cards were fiddily and often times downright confusing when it came to what you needed to keep for your contraption. The cards helped the theme a lot but sacrificed a lot when it came to functionality. The game also requires you to change cards every round ( 15 times ). That was a bummer. Place, remove, shuffle, place, remove. Extremely irritating. The changing of the spots was nice but I felt that it made the game slower and more tiring than it should have been. So far these are all components issues and game flow issues. How bout the game you say ? Well, my friends enjoyed it quite a bit. I think it will come out for another play again. I on the other hand, felt that it was ok for now. I think it took longer than needed. Our 3 player game was 2hrs 10mins. It didn't really blow my socks off or anything. I think if it were shorter and less fiddily I would have enjoyed it immensely. I'm starting to have questions about the process of the game. It seems to feel like a, grab resources at the start, do everything else at the end ( end game scoring, channelling labor hours ) type of game. That isn't necessarily a bad thing, but I question how much different the gameplay can be on future plays. I do want to take the time to find out though. So maybe I will know more on my next play. But for now, I think it is a pretty decent game, but not entirely worth my wait.